Work on a cottage in Pyle Street has provided an insight into what accommodation was like for Newport families at the lower end of the social scale. In spite of Newport's broad history, it does not have a great number of properties dated prior to the 18th century. Fortunately buildings occasionally reveal evidence of an earlier structure during rebuilding or redecoration. In recent years timber framework with wattle and daub has been exposed at properties in the High Street and Sea Street. Work on a cottage in Pyle Street has now added another example, together with some early brickwork. The cottage is one of a pair at the eastern end of the street. The original construction materials were revealed when it was gutted for redecoration. The dividing wall between the cottages is now exposed as timber frame with wattle and daub infill. Internal chimney brickwork has been revealed showing a brick size typical of the 17th century. The existing brick walls are late 18th century but a few lower courses are of earlier bricks which formed the original structure. The accommodation can now be assessed as it was prior to later development. It consisted of three small rooms: one up, one down and a loft, with a fireplace on the ground floor. Cottages like this probably housed entire families in the 17th century. In some cases their income may have come from a modest trade practised on the same premises. There are signs the Pyle Street cottage had a small backyard workshop at some point. Other cottages in the terrace were probably pulled down to make way for a new building in the 18th century. It is interesting that John Speed's Newport map of 1611 identifies a terrace of five properties in the same spot. The map shows they were somewhat isolated from other housing. Perhaps their isolation represented a social divide. In 2002 the Island's 'Local History Week' proved to be a major success in raising an interest in our past. The programme is set to return in May this year on an even bigger scale, now featuring events taking place throughout the month. In 2002 the programme brought together local history organisations, trusts and council services in a combination of exhibitions and activities, including talks, walks and historical re-enactment. The central exhibition was in Newport where local organisations attracted over two thousand visitors. The impact was far reaching, not only in increasing the membership of local groups, but in bringing together history organisations in permanent liaison within an Island forum. As previously, the project has been generated by the Island branch of the Historical Association, this time as part of their national centenary celebrations. It is being organised in partnership with IW History Forum. This year will see a wider range of events and exhibitions. The objective is to raise awareness of the Island's heritage, encourage membership of local societies and celebrate what has been achieved in the preservation of artefacts. The main exhibition will again take place at St Thomas's Church, Newport, week commencing 9th May. This time there will also be exhibitions at Ryde, commencing the 22nd May. The Ryde venues are likely to be the Town Hall and St Thomas's Church. There will be over thirty organisations represented at the exhibitions. In addition, the month will see a variety of events taking place at various locations around the Island. A number of historical walks and lectures have already been organised. One of the most popular features of 2002, re-enactment of Worsley's scandalous 18th century adultery trial, is set to return. Any organisation wishing to include a local activity as part of the programme should contact the organiser, Terry Blunden. The IW History Centre will again be publishing the full programme of events as soon as it is finalised. During a nature walk through the forest, members of the Isle of Wight Natural History and Archaeological Society came across this well pump. It emerged there was no known reference to the pump, nor any explanation for its isolated location. This prompted some historians to wonder whether we know as much about Parkhurst Forest as we thought. Further investigation has revealed other water features, some of which are even more mysterious. The pump draws water from a stone lined well. It is of a more heavy-duty design than most village pumps on the Island. The well is sited in an area that would have been common grazing land until around the middle of the 19th century, so the pump may have served that use. A further discovery has been a series of nine brick built sumps running in line through the forest, spaced generally about 40 metres apart and presumably interconnected. There may be others undetected. They are 20th century structures, varying in depth between 2-3 metres. Each sump has pipes entering opposite sides of the base and more pipes feeding in just below the top. An obvious suggestion is that they provided some sort of land drainage, but it seems too sophisticated and expensive an arrangement for such a basic function. 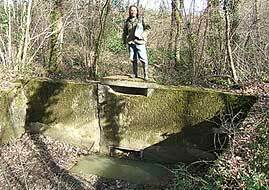 It may be the sumps are in some way connected with the forest's most unusual water feature: a concrete dam. It is thought this dam was built to create a head of water and pipe it into the prison half a mile away. With a 100 foot drop and a narrowing pipe, this could have supplied water under reasonable pressure, perhaps for the purpose of flushing toilets. However the dam appears to be of late 19th century construction, earlier than the sumps. A sump similar to the others is evident just below the dam outlet but does not seem to be directly related. Clearly there is much to learn about these features. One of the sumps (above) with iron steps running down the corner. The dam (right) shows what is probably the overflow at the top, with the pipe feed at the base.